I have remembered Peter Maag from a wonderful interpretation of Figaro at Glyndebourne in 1959, something very special, with a lightness and elegant, expressive phrasing; he never returned and I lost sight of him thereafter. These Mozart recordings, nearly 40 years on, show those same qualities. Maag's phrasing of lyrical melodies is both natural and involving. 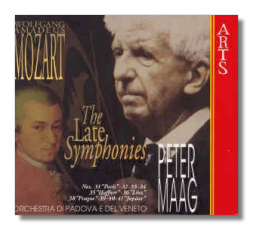 Maag, who was a Furtwängler pupil, appears to have a close relationship with the Orchestra di Padova e del Veneto. This Italian chamber orchestra is responsive to his every slight inflection and emphasis - hear, for example, the phrasing of the beginning of the G minor K. 550, instantly captivating, or the tiny pause before the last two notes of the theme of the K. 543 in Eb finale, which will make you smile - and it is all underpinned by a firm pulse. Excellent sound from the Auditorium Modigliani in Padua, with just the right amount of reverberation. ARTS fairly claims that these recent recordings 'offer the qualities of the great German tradition as well as the refinement of the modern philology and the "italian" sound of the Orchestra di Padova e del Veneto'. At bargain price, this boxed set should be considered by all who might like to refresh their Mozart collections.